further instructions have been given in your email. Correct your sketch and resubmit.. Submit next mock test asap. when are you taking your nata? Juneza, in most of your drawings, there is lack of neatness or odrer in some area or the other. why is this happening?..is it because lack of time? or patience?.....let me kow to help you better. Submit the freehand drawings by 9th of April. 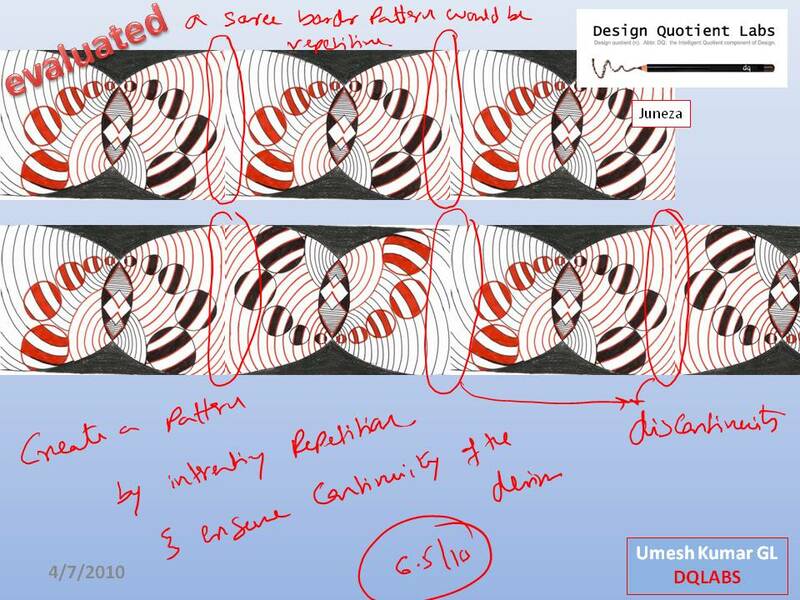 Design a saree border for a bride using geometrical shapes. color it appropriately. Design a scuplture to be installed in gront of an architecture school. Imagine you are travelling in a local train, that is jam packed with people, draw what you see. Submit these sketches by 6th of April. Attempt next mock test and submit by 29th march. Submit next mocktest sketches by 22nd March. redo the below submition as per the feedback. submit them by 8th Feb.
Attempt mock test 1 sketching questions and submit them by 1st Feb.
Neatness and Clarity is whaat you need to focus on right now for all your sketches hence forth. A little patience if employed while drawing would help you a lot. let us do a few ,more exercises in coloringand 2d till you gain subtantial progress. create 5 compositions with the sillhoutes of a clock, 3 pin plug, tooth picks and a tennis ball. get creative in the way you represent these 3d objects in 2d form. submit them by 25 th jan.
reattempt your compositions implementing the feedback. use color theory concepts while choosing hte colors. spend good amount of time on color combination. submit the drawings by 18th Jan. 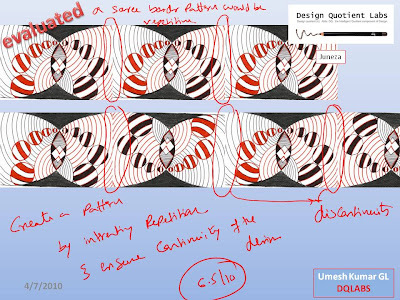 Create 5 different interesting 2 D compositions following design principles, with 3 circles, alphabets 3 ,5,7 and symbol $. Color the compositions with any 4 colors. Submit the assignment by 11th Jan 2010. Submit the next set of assignments by 14th Dec.
Coorect the kitchen sketch. i ahve sent you a new set of assignments. submit all by 7th Dec.
i have sent you some assignments by email. draw and submit them by 23rd NOV. Understand the below sketch, use one point perspective and draw the view. submit the drawing by 16th NOV.
redo the sketch as suggested . Draw a computer monitor in birds and ants eye view and submit the drawings by 9th Nov.
good job. next assigment is sent by email . submit it by 26th october. i have sent you some assignments on perspective drawing , by email submit them by 13th october. u hav a good humour! I think my drawings especially The Composition examples lacked 3D effect compared to Siddharth's can you suggest how I can improve it. 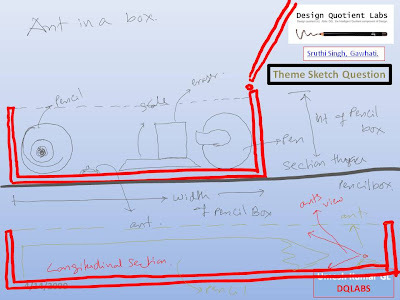 are you mentioning about 2d / 3d or theme sketches? well to bring life to any sketch, these few things are necessary. 1. correct perspective 2. correct proportion of objects used 3. highlights, shades and shadows 4. tone variation and depth in pencil rendering.5. appropriate emphasis of the subject of the sketch by using the above 4 points. get these in your sketch and your sketches will rock. can I submit the pending assignment on March 1st and continue the course then onwards. Is it possible to take NATA on september 2010 for admission in the year 2011? My date for nata has been fixed for july27. Now what should i concentrate on regarding drawing and theory??? You said we will work on my time management for drawing once the date is fixed.